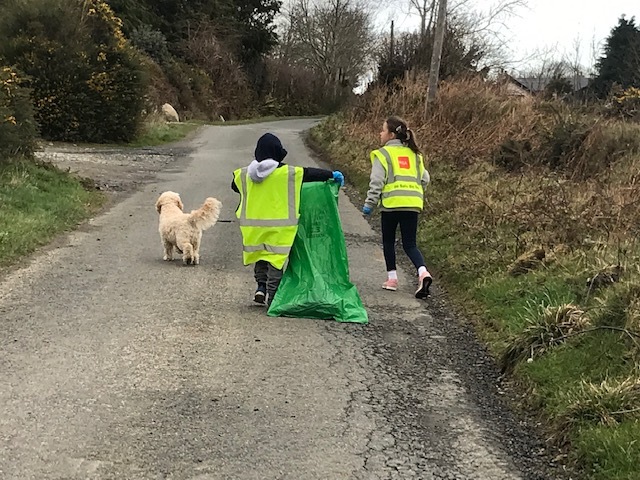 In association with the An Taisce Spring Clean initiative Roundwood and Moneystown are making plans to have a major clean up on all the highways and byways of the area. Saturday 6th of April is the designated day when all residents of the area are encouraged to head out their gates and pick any litter to be seen between their house and the next. Pass on the refuse sack to the next able bodied neighbour until the last resident or representative of your road hits Roundwood village where all the bags will be collected and brought for recycling or to landfill. It’s a great time of year to do this as the hedgerow vegetation is low and the litter that is embedded in the ditches is all too visible. If you can’t do the 6th of April – any time in April is perfect! Where it’s practical all plastics, glass and other recyclables should be bagged together for recycling. If your bag gets too heavy, no sweat – just call to arrange collection by a local volunteer. There was a great response from the community of Roundwood and Moneystown to this initiative in the last few years. If you would like to get involved this year please email info@roundwood.ie , leave a message on the Roundwood.ie Facebook page or telephone 087 2551579 or 086 8055040. There are a limited number of litter pickers & hi-vis jackets available but plenty of refuse sacks/recycling bags. If you are new to the area or would like to tackle a litter black spot do get in contact ~ it’s a great way to meet the neighbours too! Please note you are responsible for your own safety on the roads. So ‘Be Safe Be Seen’ by wearing a hi-vis jacket please. 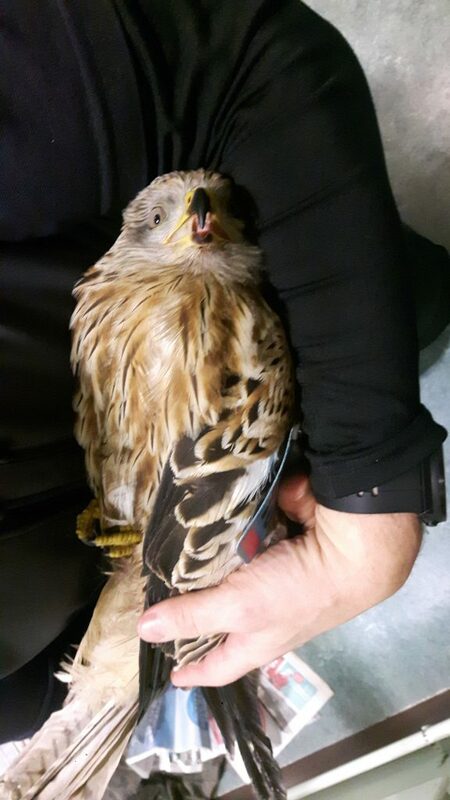 This entry was posted in News & Events on March 21, 2019 by roundwoodiewicklow. CoderDojo is a global volunteer led community of free programming clubs for young people. Young people learn how to code, develop websites, apps, programs, games and explore technology. The first session this term starts on the 23rd of February in Roundwood NS at 1:30pm. For further information and registration please see www.coderdojoroundwood.com. Booking is essential. A fashion show in aid of The Irish Cancer Society will take place in The Parkview Hotel, Newtownmountkennedy on Friday 1st March starting at 8pm Admission is €10 and there will be a prosecco reception for only €3 per glass. Tickets can be purchased from The Post Office or Ann Duffy Flowers. A great night is promised with all monies going to a very worthy cause. Roundwood Ploughing Society are holding their annual ploughing match on Saturday the 23rd of February, 2019 @ 12 noon sharp in Glasnamullen. Sincere thanks to Richard Turner for providing the site. Conventional, Vintage, Classic Tractor and Horse Classes will be catered for on Lea ground. Could all competitors please have their names registered before 6pm on Wednesday the 20th of February, with Brendan Power @ 087 2420204. Spectators young and old, as always, are very welcome and a chip van will be on site for the day. Friday 8th February saw Molly Byrne & Rachel Judd take 1st place for North/South, 2nd were John Loscher & Ger Lenihan and 3rd Monica Brady & June Digby. Securing 1st place for East/West were Maura Gaskin & Bridie Nolan , 2nd Noeleen Redmond & Margaret Bolger and 3rd Teresa Leahy & Marion Davis. Taking 1st place on Friday 15th for North/South were Maria McGee & Rowena Brady, John Loscher was 2nd once again this time with partner Gaye McGettigan and 3rd Liz Belton & Philomena Kenna. 1st, 2nd and 3rd place for East West were exactly a repeat of last week Maura Gaskin and Bridie Nolan 1st, Noeleen Redmond & Margaret Bolger 2nd and Teresa Leahy & Marion Davis 3rd. Ger Lenihan was still on a winning streak on Monday 11th taking 1st place for North/South with Margaret Bolger, 2nd Gertie Fee & Phil Power 3rd Margaret Byrne & Kay Plunkett and 4th Marie Kavanagh & Monica Brady. Judy Skates & Maria Magee were 1st for East/West 2nd Rowena Brady & Catherine Halligan , 3rd Pamela Byrne & Maura Gaskin and 4th Molly Byrne & Rachel Judd. The next active retirement lunch takes place on Friday 22nd February in The Coach House at 1.30pm. The Roundwood and District Community Council are registered to administer the senior alert scheme which provides grants to elderly people towards the provision of personal alarms. The personal alarm offers reassurance to allow independent living, safe in the knowledge that you can quickly be in contact with a family member or neighbour in the event of an emergency. It provides security and peace of mind. If you would like more information, please call 086 8055040. The results of the whist are as follows:- Top Score: Monica Brady; Top Gent: Jimmy Molloy’ Second Gent: Mick Whelan & Martin Byrne (shared); Top Lady: May Kenna; Second Lady: Catherine Doyle & Magdalen Kennedy (shared); First Half: Tiney Shortt; Second Half: Richie Cullen; Longest Sitting : Nan Wolohan & Lowest Score: Ann Pierce. Raffle prizes were won by Monica Brady, Molly Byrne, Marie Magee, Ann Pierce & Catherine Doyle. Next whist is on Wednesday 27th February in The Parish Centre. The first talk in the Roundwood Historical Society’s 2019 Series will take place on Tuesday 5th March at 8pm in Roundwood Parish Hall. The topic is the 100th Anniversary of the First Dail and will be given by Éamon Ó Cuív, TD. Éamon Ó Cuív has been a Teachta Dála (TD) for the Galway West constituency since the 1992 general election. He previously served as Deputy Leader of Fianna Fáil from 2011 to 2012, Minister for the Environment, Community and Local Government and Minister for Defence January 2011 to March 2011, Minister for Social Protection from 2010 to 2011, Minister for Community, Rural and Gaeltacht Affairs from 2002 to 2010, Minister of State at the Department of Arts, Heritage, Gaeltacht and the Islands from 2001 to 2002 and Minister of State at the Department of Agriculture, Food and Rural Development from 1997 to 2002. He served as a Senator for the Cultural and Educational Panel from 1989 to 1992. The ‘First Dáil’ of 1919 was an assembly established by Sinn Féin MPs elected to the House of Commons of the United Kingdom in the 1918 United Kingdom general election. Upon winning a majority of Irish seats in the election, Sinn Féin MPs refused to recognise the United Kingdom parliament and instead convened as the First Dáil Éireann the first Irish parliament to exist since 1801. The first meeting of Dáil Éireann occurred on 21 January 1919 in the Round Room of the Mansion House: the residence of the Lord Mayor of Dublin. Being the first and highly symbolic meeting, the proceedings of the Dáil were conducted for the only time entirely in the Irish language. The Dáil elected Cathal Brugha as its Ceann Comhairle (chairman). A number of short documents were then adopted, this included the Declaration of Independence that asserted that the Dáil was the parliament of a sovereign state called the “Irish Republic”. We look forward to seeing you on Tuesday 5th March at 8pm. The entrance fee for members is €3 and for non-members is €5 – payable at the door. There will be a five day trip to Slovenia on the 4th April to the 9th April at a cost of €699 per person sharing. As there are limited places a deposit of €200 is required asap. There will be a tour of Scotland in August/September dates to be decided & a Westport country music break in October 2019 which includes some day trips. For more details please contact Susan on 0876273032. There was no jackpot winner in last weeks draw The numbers drawn were:-2, 9, 18 & 29 There were five match three winners, Wilna McKenna, Amy Hamilton, O Healy, John Doyle & Paddy Halligan Next weeks jackpot will be €25,900. Morning badminton has resumed on Tuesday morning from 9.30pm. All are welcome. Roundwood Whizzers Walking Group are back in action meeting at 7pm every Wednesday at the Coach House car park. All welcome to walk at your own pace for approximately one hour. Angel Healing and Angelic Guidance is back tomorrow evening Monday the 3rd of September in the Parish Hall Roundwood at 7.30 sharp. So if you would enjoy an evening of peace relaxation and hands on energy healing join us for a wonderful new experience. There will be a pilgrimage to Knock on Saturday 27th April leaving Laragh at 7.45am & at Roundwood 8am. The cost is €65 per person and includes, bus, breakfast and dinner. All money to be paid by 1st April to Susan at 087 6273032. There are three places for May 20th – 24th for five days and four nights at a cos of €385 per person and also two plkaces for seven days 8th – 15th July at a cost of €585 per person. Own insurange, baggage, 10kg included. Six places from 19th – 26th July for seven days full board, no single supplement at a cost of €585 & transport from airport to Lourdes. A €150 deposit to Susan O’Neill at 087 6273032 as soon as possible. There will be a tour of Scotland from the 26th to the 31st July for six days. Included are The Highlands of Scotland and The Orkley Isles, Perth, Thurso, Inverness, Lock Lomond, Lock Ness and Glencoe and many more places at a cost of €750 per person all in. A depost of €200 is required on or before the 1st April with single supplement of €100 to Susan at 087 6273032. The Westport Country break takes place at the end of October 2019, more details to follow. This entry was posted in News & Events on February 21, 2019 by roundwoodiewicklow. Anyone free to help out with a clean-up on Saturday morning around Synnott’s Corner/ Vartry Heights entrance working our way back up the village. 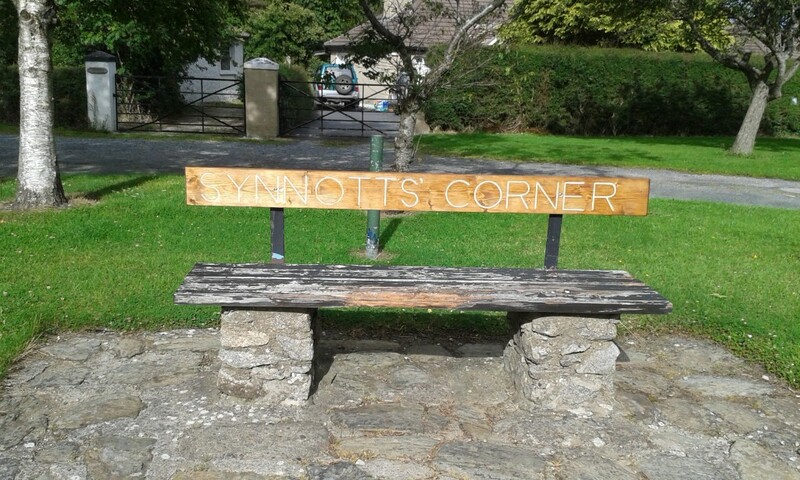 Meeting at Synnott’s Corner at 9am. This entry was posted in News & Events on February 15, 2019 by roundwoodiewicklow.